I‘ve started thinking about Modules 0 for Grade 6. And I’ve written my first sequence for inequalities, which I’ll show below. Although I tried to design the sequence using ideas from variation theory, I found that the specific goal I had for this sequence—writing inequalities of the form x < c and c < x from number line models—did not make it easy to think of a boatload of questions I could ask, each slightly different from the previous one. Plus, I had some slightly more robust instructional goals in mind. Still, I found that it paid off to even just try thinking about variation. So, I start with the video below, which serves as the first (and only) instructional worked example in the sequence. I use the Silent Teacher method, wherein I essentially show the worked example twice, the second time with my voice annotating what I’m seeing, doing, and thinking as I write the inequality to represent the two models. In the lesson, I include a brief reminder to students above the video what the inequality symbols mean and what the equals sign means. My assumptions with regard to this content are that students have seen and used inequality symbols for a long time before they get to Grade 6, though primarily with positive numbers and not variables or negatives. So, this represents a kind of “start-again” topic, which is one reason why I include the block models along with the number line model. It is a compromise between extending the concept and reviewing it: so I do a bit of both. 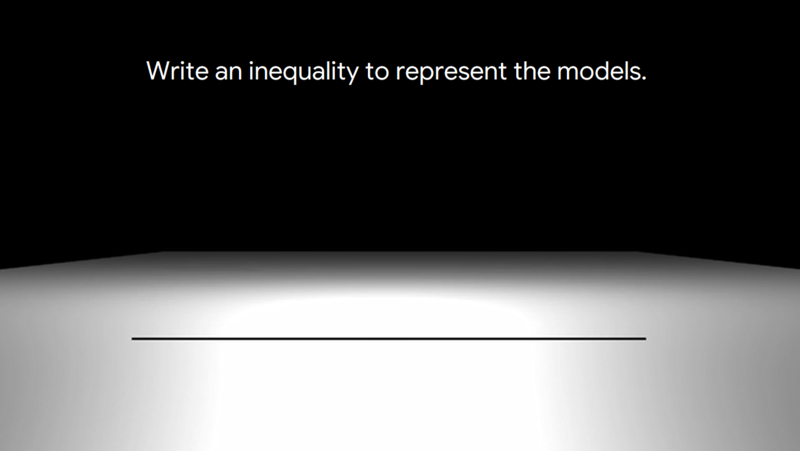 Another reason I include the block models is because they make a solid, albeit abstract, connection to the use of inequalities with algebraic expressions to express relative values in situations where we don’t know one of the values. We know that q above represents a number greater than x, but we can’t mark q on the number line because we don’t know its exact value. This is what the thinking question below the video is hopefully getting at. It’s numbered in case an instructor wants to assign the sequence to a student. After the video, there is a sequence of a mere 8 questions. The first of these, shown at the right, is not a typical “Your Turn” type of question, where the student tries out a technique on a very similar problem. Here we unpack the other ways to express the inequalities shown in the video—it’s important to constantly make the point that there is almost always a few different ways of looking at mathematical relationships—and we include the equation, in part because research tells us that comparing the equals sign with other relational operators reinforces the correct relational view of the equals sign. Next up is a more typical Your Turn, with a block model and number line model both closely mirroring the models shown in the video. Students can write n or 1 to represent the single block (or the point labeled with both n and 1 on the number line). Doing so helpfully reinforces a slightly better meaning of “variable,” which is a letter that represents any quantity, known or unknown. And here, for the first time (in a thinking question), I ask students to relate the number line model to the blocks model. The next question in the sequence is an example of some minimal variation. What’s different here is that the m and n block towers switch sides in the illustration, and the inequality model on the number line shifts to the right. Everything else stays the way it was. We could continue in this way, adding or subtracting blocks, switching sides, etc., but this kind of model has limitations that don’t allow for examining more of the variation space. But we can hint at the fact that adding the same number to both sides of an inequality doesn’t change the direction of the inequality. Would adding 1 block to each tower change the direction of the inequality? Why or why not? I phrase the question as a hypothetical because, strictly speaking, it’s not evident from the diagram that I added exactly 1 block to tower m.
Now we see how this isn’t really a sequence of minimal variation. One reason for the change-up is that I realized too late that the model I started with could only show the greater quantity as the unknown quantity. I thought about changing to a different model, one which could show the full range of variation, but I couldn’t think of a situation that worked. This example, in which the larger quantity (the greater height) is the known, was too good to pass up. And it gave me a context to foreshadow subtracting both sides of an inequality by the same number, which is what (kind of) happens in the next exercise. Here, though—and again—it was not plausible to hit this balance of operations idea directly (plus, it’s outside of the scope anyway). We only hint at it. But we still ask the thinking question—again, as a hypothetical—about whether subtracting the same value from both quantities changes the direction of the inequality. The height examples, and perhaps all of the items in the sequence, lie somewhere between minimal variation and maximal variation. At some point while designing it, I had to stop searching for more perfect examples and just run with it. The final two items in the sequence present two more (more or less abstract) situations where inequalities seem to fit. The first, shown at the right, is the “swarm,” which contains too many items to count, though we can know for sure that the number is a greater value than 6. Here too is an example situation that better fits with the idea of a larger unknown that couldn’t be handled by the earlier block models. In this example, I’ve switched up the labels on the number line for a small taste of minimal variation within all the macro variation going on. Finally, there’s temperature and a quick example showing negative numbers. What we get at here, also, is that we haven’t left the universe of comparing numbers just because we’re introducing a little algebra. Plus, I’ve eliminated the number line model here, just for a little flavor—and it’s too close in appearance to the thermometer levels. I didn’t want that confusion creeping in. It’s always fun to build things that allow for (a) generative responses and (b) flexibility in responding. This “in action” video from our upcoming lesson app on systems of equations does those two things. Students are asked to build a linear system with a given solution (generative), and there are an infinite number of ways of doing this (flexibility)! We’re always looking for ways to incorporate generativity and flexibility in students’ work, along with the more typical stuff. It helps make the learning a little more interesting without dispensing with the rigor.